Williams, CA. January 27, 2018....... 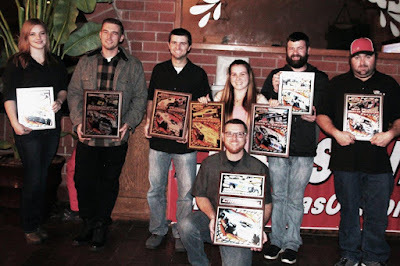 The fourth annual awards banquet honoring the top ten drivers in the 2017 North State Modified Series (NSMS) was held Saturday night at Granzella's Banquet Facility in Williams, CA. Business Manager Nadine Strauss acted as master of ceremonies. Speakers included Mort Houston, founder of the Lloyd Burton Challenge, Chris Scribner, series sponsor and owner of both Scribner Plastics and Racer Bling, and series co-promoters Jeff Stephens and Bob Strauss. Darrin Knight of Kelseyville was crowned NSMS champion for the third consecutive time. Knight won the second annual Sinister Diesel Gene Welch Classic at All American Speedway in April and followed that up with a big win at Lakeport Speedway in May. He suffered a win-less streak until September 9 at Redwood Acres Raceway in Eureka where he set fast time and captured his third season main event. Second place honors went to Charlie Collins of Upper Lake for the straight second year. Collins won the Sunoco/Penney Racing Supply fast time award on opening night at All American Speedway. Ten of his 11 races in 2017 were top-10 finishes. His solo win came on July 8 in Ukiah. Last year's NSMS Sunoco Rookie of the Year, Darrin Sullivan of Kelseyville, finished third overall again this year. Sullivan was on fire in 2017, capturing two feature wins.... the O'Reilly Nor-Cal 60 at Redwood Acres Raceway in Eureka, and the “Lloyd Burton Against the Wind Modified Challenge” at Shasta Speedway in September. Fourth place went to Kelseyville's Eric Johnson. Out of the 11 races scheduled, Johnson finished in the top ten 10 times. His best finish was a second at Lakeport Speedway. Sierra Furia of Lakeport, our top female driver, ended the season in fifth with NSMS. She never missed a race and ran up front at each event. Furia finished a very impressive third at Redwood Acres Raceway at the Memorial Day Modified Classic. She also qualified third fast that same day. Finishing in sixth was Cloverdale's Dustin DeRosier. The DeRosier team had good intentions of racing with NSMS from year one, but different circumstances dictated that they could not. He was at the track at every race in 2017 capturing seven top 10 finishes. Jason Philpot of Sacramento won more races than any other NSMS driver in 2016. The competition was stiffer this year, and although he never won a main event, he finished second twice, third 3 times and fourth twice, earning seventh place overall. Eighth place went to veteran driver Richie Potts from Petaluma. Potts missed a few races this season, but was always there trying to make his car faster. He was the winner of 2 Lucas Oil Dashes for Cash, had 4 top 10 finishes, and enjoyed watching his #83 modified finish 2nd at Eureka with Kyle Tellstrom behind the wheel. Adrianna Strugnell of Kelseyville, our other female driver, finishing in ninth place in her first full season with NSMS. The highlight of her year came on July 18 at Ukiah Speedway when she won the Lucas Oil Dash for Cash. She also enjoyed two top 10 finishes. Tenth place finisher, Cody Braund of Redding, left his #18 home this season to drive the Bob Lehman #82 modified. It was a frustrating year for Braund with many mechanical problems, but he hung in there to finish in the top 10. The 2017 Sunoco Rookie of the Year honors went to Simi Tour of Potter Valley. Tour was vacationing in Mexico and was not in attendance. Special $1000 Lucas Oil products certificates were awarded to Knight, Sullivan and Johnson. Strugnell, Braund and Eric Price Jr. each got a $600 Lucas Oil certificate. DeRosier received the an $800 ASI Racerwear bonus, and Furia collected the Five Star body nose piece. Recognition went to all the NSMS officials as well as the series sponsors Protect the Harvest, Lucas Oil, Sinister Diesel, Ward Ranches, Penney Racing Supply, American Racer Tires, Naake Suspension, Sunoco Race Fuels, Five Star Bodies, Racer Bling, Keyser Racing Products, Scribner Plastics, DJ Safety, the Buckhorn Bar & Grill, Economy Heating & Air and Mort Houston.